My mom's (and mine too) genographic journey out of (and then back into) Africa. Follow the red lines/arrows. Above is my mitochondrian genetic journey, a journey of my maternal lineage, which was uncovered with the National Geographic Genographic Project. It was traced by analyzing my mom's mitochondrial DNA (mtDNA), which is different than the normal DNA which encodes our body. Normal DNA is found in every cell (almost) and it comes half from your father and half from your mother. But mtDNA is different, and is completely separate. It is found only in the mitochondria, a cellular organelle which functions to produce energy for the body (it burns sugar and turns it into energy we use everyday to live and keeps us warm). Mitochondria are found in many cells in your body. mtDNA doesn't look like normal DNA either. It resembles bacterial DNA. That's because it is bacterial DNA. Millions of years ago, a bacterial cell was taken in by a eukaryotic cell (ie animal or plant cell). Somehow the bacteria survived inside of the cell, and eventually became a permanent part of it. It is believed that it may have provided needed energy for the cell. In the modern world today, all that is left of that bacteria is its DNA, called mtDNA, which resides in the cellular organelle called the mitochondria. The mtDNA has a slow mutation rate. It will randomly mutate once every X amount of years, and then get passed down. Scientists can track its mutations by analyzing these changes in the mtDNA sequence. Since we know the rate that it mutates, we can use it to look back in time and use it to track our ancestral lineages. For example, when comparing a sample of people, the mutations that are most common between all of the people must have happened long time ago from a common ancestor. We know how long ago that ancestor might have lived because we know the mutation rate. Once tribes of people started branching off from each other, they developed distinct and separate mutations. So in a sample of people, the mutations that are least common between the group are probably the most recent. Organizing all of these mutations from a large sample of people's mtDNA sequences can lay out a map of human genographics, especially if the samples come from people who have lived in isolated areas of the world for a long time. The mtDNA sequence is very short (only 569 letters) compared to the amount of "letters" in normal DNA, which exceeds billions. As you can see, the amount of letters in my mom's mtDNA can all fit in that small picture (from the Genographic Project). The letters in yellow represent mutations which are substitutions - one letter was swapped with another one by mistake, and passed on. These must have been harmless substitutions which didn't effect the function of the mitochondria. Its these yellow mutations that the scientists in the Genographic Project are looking for to use as markers. What other people in the world do we share them with? Comparing my mom's results to the rest of the mtDNA data bank tells us where my maternal ancestors came from geographically and on what timescale. mtDNA is only passed from the mother. Like I said before, it is completely different and separate from normal DNA which is a mix of our mother's and father's DNA. mtDNA only comes from the mitochondria organelles that were present in the egg cell. There is no mitochonria in the sperm that contributes to the new embryo. So female babies will get mtDNA from their mother's egg. So will male babies, but they won't be able to pass them on. Only females can pass down mtDNA. For this reason, mtDNA can only show the maternal lineage of ancestors. So at one point, there must have existed a "mitochondrial Eve," a female which gave rise to all the modern human females. Her mtDNA mutations we all carry, so they are the oldest mutation. 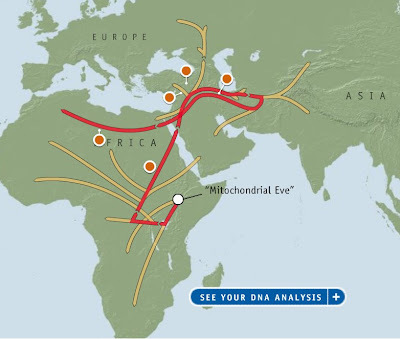 Since we know the rate at which mtDNA mutates, scientists have estimated that this so called mitochondrial Eve lived about 150,000 to 170,000 years ago in Africa. But scientists have found fossils of early hominids much much older. In fact, bipedal type hominid fossils have been found that are up to two million years old, but the earliest modern humans (Homo sapiens) didn't evolve until about 200,000 years ago. And apparently none were able to sustain a genetic lineage until at most 170,000 years ago when mitochondrian Eve was born.